When you receive your basic bond from the TTB, you have a concurrent bond which covers your tasting room, if it is part of the winery bonded area. Wine will transfer to the Tasting Room in bond for two reasons: to be sold or for tastings. You use the in bond transfer to delay paying excise until the wine is used up for tasting or sold from the Tasting Room. Set up your Tasting room as a Customer in the Address book. Head into Winery Setup > Infrastructure > Winery Building. Set up your Tasting Room as a building, owned by your winery. Now head into Winery Setup > Infrastructure > Storage area. 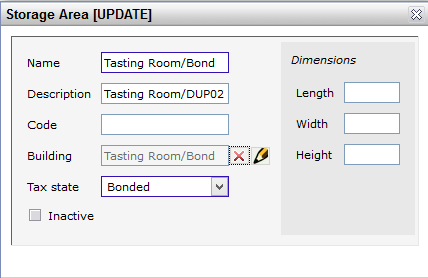 Create a new Storage area in the Tasting room building; set the Tax state to Bonded. Note: it is good practice to include the tax state in the name of storage area so that stock isn't moved in the wrong area. Once moved into the Tasting Room in bond, your wines used for tasting can be adjusted using the reason Used for Tasting (add this to your Winery Setup > Manufacturing > Adjustment Reason). 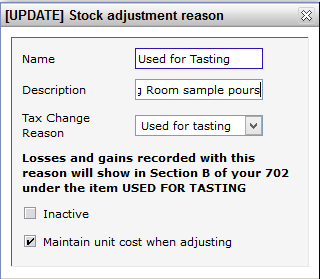 These adjustments show up in your TTB report under Used for Tasting (section B). It is not uncommon for Tasting Rooms to run a weekly or monthly sales and consumption report or maintain a hand-written inventory list or an Excel spreadsheet. You may choose to use these reports after-the-fact to adjust your Tasting Room stock to reconcile sales/tasting pours. You will want to ensure that you are able to cut-off these entries by the end of each of your TTB reporting periods. Use the Stock adjustment operation as shown below. Notice that the adjustment is for 0 volume; this is used to register the Adjustment reason Used for Tasting. If your Tasting Room has a tax-paid area, set it up as shown below; you move wines from a bonded area into this tax-paid area and dispatch wines for sale and tasting as tax-paid from this location. You use this tax-paid storage area when you want to pay your excise taxes as soon as transferred to the Tasting Room instead of waiting to adjust for tasting or dispatching tax-paid for Tasting Room sales. When you are ready to remove wine from the Tasting Room's stock, the operation is the same regardless of the wine being stored in a bonded or tax-paid storage. Note: only the first operation (movement into a tax-paid area or dispatch as tax-paid) will show up on the TTB report for that period. Once a wine/stock item is identified as tax-paid it is never again reported on the 5120 report). If you have questions, please contact your Compliance Officer, your legal adviser or the TTB. How do I re-print a work order?